Close all programs— You can often fix flaky behavior by shutting down all your open programs and starting again. This is a particularly useful fix for problems caused by low memory or low system resources. Log off Windows Vista— Logging off clears the RAM and so gives you a slightly cleaner slate than merely closing all your programs. Reboot the computer— If there are problems with some system files and devices, logging off won’t help because these objects remain loaded.  By rebooting the system, you reload the entire system which is often enough to solve many computer problems. Turn off the computer and restart— You can often solve a hardware problem by first shutting your machine off. Wait for 30 seconds to give all devices time to spin down, and then restart. Check connections, power switches, and so on— Some of the most common (and some of the most embarrassing) causes of hardware problems are the simple physical things: making sure that a device is turned on; checking that cable connections are secure; and ensuring that insertable devices are properly inserted. Use the Help and Support Center— Microsoft has greatly improved the quality of the Help system in Windows Vista. The Help and Support Center (select Start, Help and Support) is awash in articles and advice on using Windows Vista. However, the real strength of Help and Support is, in my opinion, the Support side. In the Help and Support Center home page, click Troubleshooting to see links for general troubleshooting and for fixing specific problems related to hardware, email, networking, and more. Note, too, that the Help and Support Center offers a number of Troubleshooters—guides that take you step-by-step through troubleshooting procedures. Windows Vista comes with new diagnostic tools—together, they’re called the Windows Diagnostic Infrastructure (WDI)—that not only do a better job of finding the source of many common disk, memory, and network problems, but can detect impending failures and alert you to take corrective or mitigating action (such as backing up your files). The next few sections describe these new tools. Although SMART has been around for a while and is now standard, taking advantage of SMART diagnostics has, until now, required third-party programs. However, Windows Vista comes with a new Diagnostic Policy Service (DPS) that includes a Disk Diagnostics component that can monitor SMART. If the SMART system reports an error, Vista displays a message that your hard disk is at risk. It also guides you through a backup session to ensure that you don’t lose any data before you can have the disk replaced. Your system can become unstable if it runs low on virtual memory, and there’s a pretty good chance it will hang if it runs out of virtual memory. Older versions of Windows displayed one warning when they detected low virtual memory and another warning when the system ran out of virtual memory. However, in both cases, users were simply told to shut down some or all of their running programs. That often solved the problem, but shutting everything down is usually overkill because it’s often the case that just one running program or process is causing the virtual memory shortage. The Resource Exhaustion Detection and Recovery tool divides the current amount of committed virtual memory by the commit limit, the maximum size of the virtual memory paging file. If this percentage approaches 100, RADAR issues its warning. If you want to track this yourself, run the Reliability and Performance Monitor , select Performance Monitor and add the % Committed Bytes In Use counter in the Memory object. If you want to see the exact commit numbers, add the Committed Bytes and Commit Limit counters (also in the Memory object). Windows Vista also comes with a Memory Leak Diagnosis tool that’s part of the Diagnostic Policy Service. If a program is leaking memory (using up increasing amounts of memory over time), this tool will diagnose the problem and take steps to fix it. After the test runs (it takes 10 or 15 minutes, depending on how much RAM is in your system), Vista restarts and you see (for a short time) the Windows Memory Diagnostic Tool icon in the taskbar’s notification area. This icon displays the results of the memory test. If you’re having trouble starting Windows Vista and you suspect memory errors might be the culprit, boot your machine to the Windows Boot Manager menu . When the menu appears, press Tab to select the Windows Memory Diagnostic item, and then press Enter. If you can’t get to the Windows Boot Manager, you can also run the Memory Diagnostic Tool using Vista’s new System Recovery Options. Microsoft constantly collects information about Vista from users. When a problem occurs, Vista usually asks whether you want to send information about the problem to Microsoft and, if you do, it stores these tidbits in a massive database. Engineers then tackle the “issues” (as they euphemistically call them) and hopefully come up with solutions. One of Vista’s most promising new features is Problem Reports and Solutions, and it’s designed to make solutions available to anyone who goes looking for them. Vista keeps a list of problems your computer is having, so you can tell it to go online and see if a solution is available. If there’s a solution waiting, Vista will download it, install it, and fix your system. If a solution exists for your computer, you’ll see it listed in the Solutions to Install section of the Problem Reports and Solutions window. Click the solution to install it. 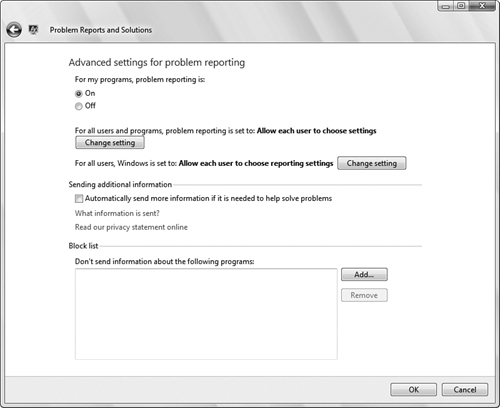 In the Choose How to Check for Solutions to Computer Problems window, click Advanced Settings to display the Advanced Settings for Problem Reporting window shown in Figure 1. Figure 1. Use the Advanced Settings for Problem Reporting window to configure the Problem Reports and Solutions feature. Automatically Check for Solutions— Activate this option (it’s the default) to have Vista automatically check online for an existing solution to a problem. If you don’t want Vista to send information about a specific program, click Add, locate and select the program’s executable file, and then click Open.